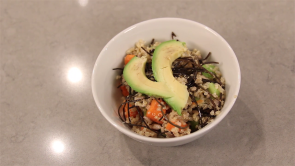 Marni Wasserman of Marni Wasserman’s Food Studio and Lifestyle Shop shows us how to make a delicious and healthy Quinoa Salad. Cook the quinoa in the water for 15 minutes until tender. Drain and let cool. Add all the salad ingredients minus the sunflower seeds and avocado in a large bowl and stir. Add all dressing ingredients in separate bowl and whisk well, add to salad along with the sunflower seeds and avocado as garnish. Enjoy! Marni Wasserman’s Food Studio and Lifestyle Shop is located in midtown Toronto, Ontario. Offering a variety of organic vegetarian cooking classes, workshops, lifestyle products in an inspiring sustainable space where people will also be able to host events and private parties with a focus on health and good food. The trend is booming, people are starting to look to their nutrition as a major player in their health. The one thing that we have control over everyday is the food we consume. Marni’s mission is to make nutrition and wellness as fun and experiential as possible through hands on cooking classes and workshops. Most importantly she wants to inspire people to get into the kitchen and re-connect with the impact that their food choices make on their health.